Image: wordcloud of common terms used in describing STEM internships arranged in a pi shape to highlight the notion of a so-called Pi-Shaped Researcher (with both quantitative and disciplinary depth), see Informatics in the Future, Chapter 2, October 2015, Springer. Credit: Vrushali Bokil & Nathan Gibson. Text editing done by Joy King. Think BIG! Jobs in Business (B), Industry (I) and Government (G) are consistently rated among the highest areas for job satisfaction [BIG Jobs Guide, SIAM 2018, Internships-SIAM], and mathematicians are in demand for their skills. For many students a summer internship can be their first and formative experience in a BIG job. An internship can also help students get a leg in the BIG firm creating an opportunity for a future position in the place of the internship. Why Should you do an Internship? [see BIG Math Network] Read on for the experiences that Oregon State mathematics graduate students had during the summer of 2018. It was an exciting and fruitful time for many of the Department’s Graduate Students who gained research experiences in internships or workshops. Joseph Umhoefer’s summer internship was a return trip to Lawrence Berkeley National Lab (LBL) for him. Working with LBL researchers, he wrote a flow solver for anisotropic porous media. This work is relevant to flows through the subsurface, fuel cells, wood, etc. Umhoefer found working for the lab provided experience learning a variety of tools that are valued on the job market. Choah Shin had an exciting and intense internship experience in the STOMP group of the Energy and Environment Department at Pacific Northwest National Laboratory (PNNL). STOMP was originally designed to simulate subsurface flow and transport and had been extended to investigate gas hydrate productions, a topic closely related to Shin’s thesis on methane hydrate basin modeling. The learning curve on the new subject was steep, but she found herself enjoying the challenges. Through this experience, she gained technical skills that she would not have learned in school and more expertise for her goal as a researcher. Alex Putman began his internship at Maiden Reinsurance by building statistical models for a large data set (over 250,000 entries) to calculate an expected cost per year for each of the customers in order to better inform an insurance company how to price customers based on many different factors. He learned and used a variety of models and methods specific to insurance problems and was given the opportunity to search for new models, learn about them, and try to implement them into their work. Finally, Putnam worked on building programs to automate a search for optimal parameters for different functions pertaining to modeling. For example, he wrote a code that took a set of data, and found an optimal distance to cluster points in the set to automatically cluster the data in ways that could not be done by hand. Lisa Bigler participated in two summer schools. The first half of the Summer School on Computational Physiology(SSCP2018) was in June and took place in Oslo, Norway. This part was dedicated to lectures and gave all the participants some common background knowledge on computing and physiology. The second half was focused on small group work, concluding with 15 minute presentations, and was held in San Diego, California. Bigler attended a second summer school at the Mathematical Sciences Research Institute on Representation of High Dimensional Data. The first of two weeks consisted of lectures and exercises on data mining. The second week was focused on career development and research in industry, with lectures from both academics and industry professionals. Sebastian Naranjo’s work at Los Alamos National Laboratory (LANL) was a challenge, as well as, a rewarding experience. Two to three times per week Naranjo would meet with his supervisor in the T5 research group in Applied mathematics and plasma physics. Together they developed a novel discretization for the evolution of the electric and magnetic fields in an ionized gas. Sebastian feels very fortunate to have received training at LANL. His officemates became his unofficial mentors. They were engineers and computer scientists, so the conversations about academic topics revolved around fluid flow and high performance computing. How to get Started: To get started planning a summer internship or other research we recommend that students start by seeking guidance from their advisors. Also, see a review in SIAM News of a professional development event for graduate and postdoc students at the annual SIAM meeting in summer 2018. The event highlights the importance of an honest "inside-out" self-analysis of one's strengths, weaknesses and passions in addition to building strong professional soft skills such as communicating and networking. A useful read for all job-seekers and career-builders! Lastly, a great resource to help plan your internship is the BIG Math Network Site. Below are some tips from this site to get started. Who am I? identify your goals and personal values. What should I do? plan classes to take, craft a great résumé, and try out an internship. What will I learn? learn about career options, and research and apply for full-time jobs. Will I be successful? interview with confidence; you know the job matches your skills and values. What is important to keep doing? Network, network, network. 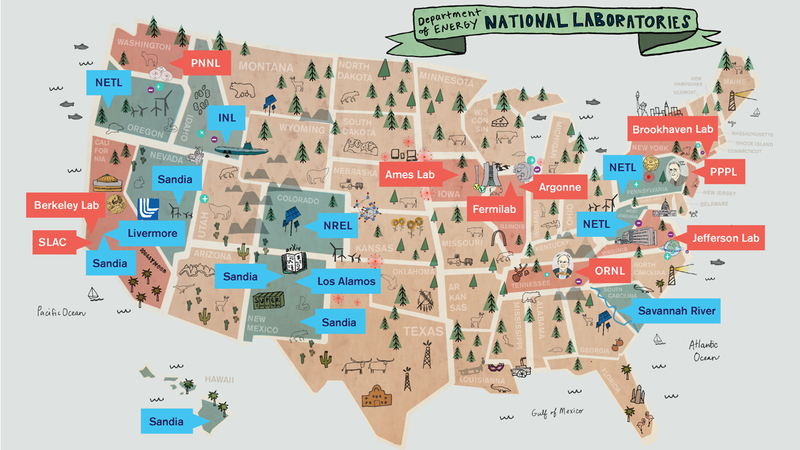 The 17 Labs of the Department of Energy are a good place to look for government internships, see Around the US in 17 Labs, Symmetry magazine. This article was created by the Newsletter/Media Committee. Please email alumninews@math.oregonstate.edu with any comments.